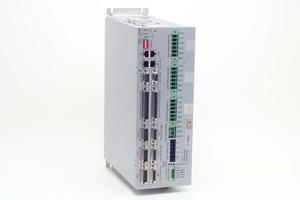 A line of EtherCAT modules with up to 3 universal drives. The UDMhp addresses high accuracy demanding applications. The UDMba is a more economical version. The modules are offered with three current levels: 5A/10A (cont./ peak), 10/20A and 15/30A. The modules are powered by a single or three-phase AC input from 24 to 265Vac (rectified internally to generate a Vac x 1.4 motor bus voltage) and by a separate 24Vdc control supply that keeps all logic signals alive during emergency conditions. It supports a wide range of position feedback devices: incremental digital (total of 4), analog (SIN-COS), and absolute encoders.